While digging through companies left for dead and trading below their net asset level an investor is due to stumble upon some strange creations, Ace Aviation is one of them. Ace was created in 2004 as a sort of spinoff from Air Canada in a bid to unlock shareholder value. It appears that Air Canada dumped some assets such as Aeroplan, Air Canada Jazz, and Air Canada Cargo amongst others in a way to improve the share performance of Air Canada. Over the years Ace Aviation has sold off all of the assets that were given to it upon the 2004 creation and now the company is left holding Air Canada shares and cash. What's interesting is in many companies similar to Ace they would sell off assets and then use the cash to make a foolish acquisition. In the case of Ace as they've sold assets they have returned the money to shareholders. This is a pretty simple investment, Ace is trading at slightly above cash (C$378m market cap vs C$363m cash) holds a considerable investment in Air Canada and is in the process of winding down and paying out to shareholders. Before going on I should note there are two share classes, class A and B. Class A is only able to be held by non Canadians, and if the ownership transfers to a Canadian the share converts to a B share. Likewise B shares are only able to be held by Canadian citizens and will convert to an A share if ownership transfers to a non-Canadian. This share structure seems confusing but due to the convertibility of shares it's easy to ignore, just examine the total common shares ignoring the class they belong to. 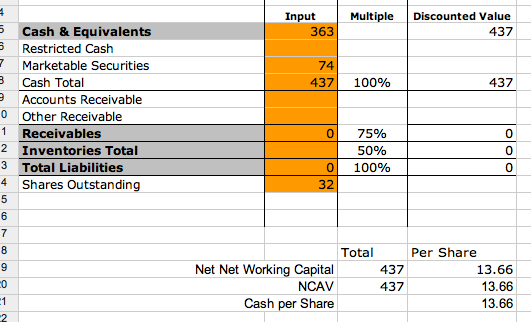 My net-net worksheet is below, I used the 2010 annual report for cash, and the current value of the Air Canada shares for the equity portion. -Ace has been actively winding the company down and distributing cash to shareholders. -Ace has also been slowly buying back shares, for a company trading below book value share buybacks increase the book value of the company. -The value of the company is accurate due to the liquidity of the holdings. -The Air Canada holdings are fairly easy to hedge with either options or by shorting Air Canada common. -17% upside to get Ace to the market value of it's holdings. -In 2009 the value of the Air Canada equity holding went from a book value of C$721m to C$107m a significant loss. -The Air Canada holdings have fallen in 2011 already reducing the value of the equity holding to around C$80. -Air Canada is a fairly volatile stock so the holdings could fluctuate quite a bit, as they have in the past. Disclosure: I do not hold any of the issues mentioned in this post. I live in Montreal Canada - I got really interested in your net net valuation of ACE.B.TO I just called my dad (works in the Cargo flight business in Montreal) and asked him whether he knows anything interesting about ACE. He says that he doesn't see much ACE flights these days. They usually do Cargo flight. If I hear any additional info, I'll let you know. Good site BTW! Thanks, interesting information. I know ACE was winding down their cargo operations and I believe sold off part of them recently, I'm not sure if they're still operating under the ACE banner or not. I was hoping to have a good series of posts about Canadian net-net's but there really isn't that much out there unfortunately. Hopefully something will come along soon.